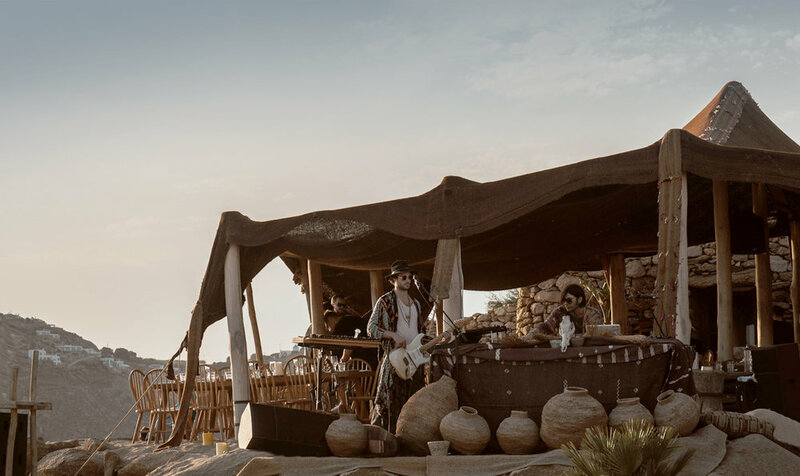 Built by a pioneering nightlife duo on the five pillars of food, healing, design, art, and music, scorpios embraced the symbols and traditions of ancient island moon rituals. Scorpios was born in 2015 as a modern reimagining of ancient social rites and island ritual. Thomas Heyne and Mario Hertel, two Germans who came together within the electronic music scene of the 1990s, has spent a decade in Mykonos, turning the Paradise Club into one of the world's most popular nightclubs and launching San Giorgio in 2012 as a pop-up Design Hotels™ Project destined to become a beloved permanent fixture of the island. Seeing a clear shift from thumping beats to balance-restoring cultural gatherings, they launched Scorpios in 2015 as a contemporary interpretation of the ancient Greek agora, a gathering place meant to galvanize the artistic, spiritual, and social life of the community. Embracing the tradition of island moon ritual, Scorpios brings the mystical charge of nighttime into the day, always building on the five pillars of food, healing, design, art, and music. In envisioning Scorpios, its makers turned the symbols of ancient ritual and occultism, finding its key iconography—as well as its original logo—in "The Moon," the 18th Major Arcana in a traditional Tarot deck. The card depicts a night scene in which the moon rains down rays of light onto several animals, including a spiny arthropod that rises upward from the water toward the moon. The image is believed to represent life of the imagination apart from life of the spirit, conveying the idea that intellectual illumination alone cannot reveal the great mystery of the spirit.